The U.S. Defense Secretary has reiterated his support for relocating Futenma base to Henoko. 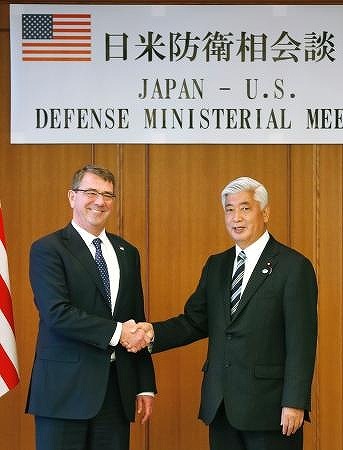 Ashton Carter made the comments during a meeting with Defense Minister Gen Nakatani in Tokyo on April 8. Nakatani began the meeting by saying, “The Japanese government will steadily carry out the plan to relocate U.S. Marine Corp Air Station Futenma to Henoko, Nago to reduce the burden on Okinawa and to maintain a deterrence capability based on the two-plus-two meeting held in 2013.” Carter stated that it was important to move forward with the realignment of U.S. forces in Japan, including the relocation of Futenma Air Station, in order to uphold the Japan-U.S. alliance. Carter also said that revising U.S.-Japan bilateral defense cooperation guidelines could have a big influence on the world. He added that the revised bilateral defense guidelines would contribute not only to peace and stability in the Asia Pacific region but would also strengthen the Japan-U.S. alliance. The two agreed to settle the matter as quickly as possible before a so-called “two-plus-two meeting,” between U.S. and Japanese foreign and defense ministers, is held in Washington D.C. at the end of April.